Produced in response to the ‘call for entries’ exhibition theme POINT – curated by Emma Powell and Melanie Bush of ‘we love your books’, this altered book takes the subject of needlepoint as its basis. Working with a 1930s edition of Embroidery without Tears, this altered book explores the idea of the traditional sampler; pages are decorated with cross-stitched letterforms and decorative detailing. Phrases offering needlework advice to the embroiderer are rubber-stamped throughout the book. The book is contained within a fabric slip-case. 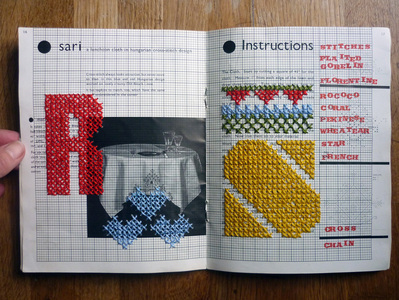 This book has been purchased by Winchester School of Art for the Artists' Book Collection. This is a collection of national standing.